Gasoline prices are rising across the country, and has led one Iraq War veteran to buy a Chevy Volt to ease the pain at the pump. If gasoline prices stay high we can expect more interest in fuel efficiency, especially on electric vehicles, just as fuel efficiency was a hot topic amid 2008's high fuel prices. 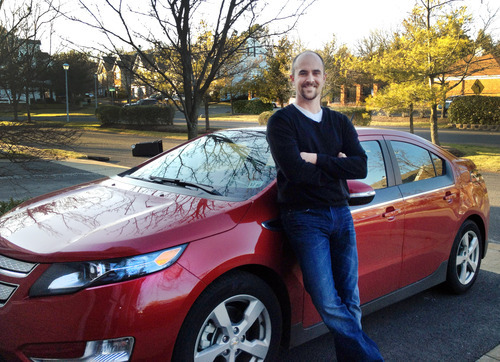 Bob Tanner, the Volt-owning-veteran, has a 62 mile round trip in his daily commute to his civilian job at Fort Dix. This is an farther-than-average daily commute, because the typical driver (according to the NHTSA) drives 40 miles or less a day. GM designed the Chevy Volt to have an electric driving range matching the typical daily driving distance, so that the typical driver could conceivably handle their typical daily driving purely on electricity. Tanner, because of his longer commute, does burn a bit of gasoline, but it's a fraction of what he used to burn. He claims to have cut monthly fuel costs by two-thirds, from $300 per month to just under $100 per month. The fuel costs break down as $50 a month for gasoline and $40 a month for electricity. Many describe this line of reasoning as a national energy security concern. Because the U.S. has only 2% of the worlds oil reserves, and because the U.S. went past its peak of oil production in 1970, it's nigh-on-impossible for the U.S. to satisfy its own fossil oil needs. Because the U.S. is completely dependent on fossil oil driven vehicles, it leaves the U.S. dependent on foreign countries (not all of whom are friendly to the U.S.) for the fuel to drive these vehicles. Clearly those foreign countries wield huge leverage and financial power over the U.S., and Tanner sees Chevy Volt ownership as a "contribution" he can make "toward the overall mission.” President Obama is pushing this same line of reasoning as justification for a strategic move away from fossil oil, to alternative fuels including electric vehicles and liquified natural gas. The Chevy Volt has a total driving range of 379 miles based on EPA estimates, so how can Tanner be getting 640 miles per tank? The trick is to recharge the battery pack at every opportunity. The 379 miles range is the 35 miles in the battery pack, and the 340 or so from the gasoline in the gas tank. However, the more a Chevy Volt owner drives on electricity, the less need there is to burn gasoline. Tanner's daily commute of 62 miles is further than the 35-40 miles he can drive on electricity, leaving him with 30 or so miles a day to drive on gasoline. If he were able to recharge the Volt while at the office, even more of his miles could be on electricity rather than gasoline, and his savings would be even more dramatic. He could have bought a Prius C, had about the same $100 a month fuel cost, no electricity charge or inconvenience, paid less than half the price saving over $20,000 and, most importantly, not cost the rest of us 99 percenters $7500 plus state credits in tax subsidies. Author must know this, why the misrepresentations on the Volt? Why do you think the Prius C sold more in 3 days than the Volt has in about a year and a half? The car doesn't make economic sense, and yet shills for GM continue to hype the vehicle and act as if the gas savings make up for the high cost. If they did, the car would sell more. Most people can figure this out, regardless of how hard you try to fool them. Mark, think big picture: 1) Reduce dependency on foreign oil 2) Support the emersion of a different kind of automotive infrastructure 3) Support a U.S. company, one who builds its cars in a severely depressed area (Detroit) Those things, plus saving money by driving on the electricity alone, and the fact the Volt's design and performance/handling out-match the Prius...those are the reasons I just ordered my Volt. I look forward to not being the 'hybrid guy' who is in everyone's way on the on-ramp. My wife is an Iraq war vet and I'm a Gulf War vet and we bought a Mazda. Do we get a press release too? This is just more flag waving b.s. By the way Dan, nobody cares about Detroit or the UAW idiots who screwed themselves out of jobs by pushing their employers into bankruptcy with their $78/hour pay plus benny packages. Besides, this guy can probably afford it, since his "civilian job at Fort Dix" probably pays $200k a year. Given the kind of big money subcontracting they do at Dix, that is probably low balling it. Hey Suthy, The car starts at just under 40k - a tax rebate...but...I opted to do the lease which is a great deal at 350 a month. The reason nobody cares about your Mazda, besides the obvious (how boring mazdas are), is because it's more of the same...relying on gasoline to transport you from A to B. If a more modern infrastructure was to emerge, allowing us to stop relying so heavily on nutball countries with oil...is that such a bad thing? I have no problem with you buying a crap Mazda, burning all the gasoline you want, but I think it's great that others are a little more open minded than you, k cupcake?